"These guys did an awesome job. Saved our pending sale from being ruined and worked hard to finish on a Saturday. We really..."
By Bill & Anne S.
"Very satisfied with the job. All employees were professional and pleasant. I would recommend to my..."
Very satisfied with the job. All employees were professional and pleasant. I would recommend to my friends. By John And Janet S.
"The installation crew was very professional." The installation crew was very professional. By Manuel & Maria B. "The friendliest guy I ever had the pleasure to work with." The friendliest guy I ever had the pleasure to work with. By Nancy & Bill S.
"A neighbor of ours had some work done and recommended Ayers. We received quotes from your company and a competitor (StayDry) and..."
A neighbor of ours had some work done and recommended Ayers. We received quotes from your company and a competitor (StayDry) and found your system more likely to be effective. Later we spoke to some acquaintances who had work done by Ayers years ago and they are still quite satisfied. 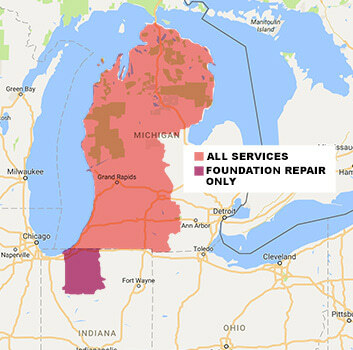 Bringing a comprehensive, personalized approach to every job, Matt will evaluate your areas of concern and provide a solution to quickly and effectively stabilize your sinking, settling concrete. Matt’s customers recommend him and the Ayers Team to their family and friends. Matt graduated from Baker College with a Drafting and Design Degree. His diverse background includes staging and seating for sporting and corporate events, managing a CAD department, and customer service at a home maintenance business. Matt also completed extensive training to evaluate your waterproofing, foundation, and crawl space repair needs. In addition, as part of the service team at Ayers, he responds if you need help after installation and to do annual maintenance. A customer in Jackson had some unlevel steps and walkway in his front yard. We came to the rescue with our PolyLevel technology. We injected this expanding polymer into the concrete slab which then supports and levels the concrete stronger than ever, within minutes. Now that this walkway is level. The homeowner can have peace that nobody will trip due to unlevel concrete at their home. How do you think the water that comes in your basement from the walls or floor get out of your basement? I mean it can't rely solely on gravity to drain it. You need a sump pump to pump the water out and get it far enough away it can't come right back in. Sometimes sump pumps break or get old and stop working but no worries we have plenty of options for every budget and every basement. This customer in Jackson, MI had the current sump pump but during rainy seasons it ran non stop and they wanted something that didn't have to run so often but still got the job done without flooding their basement. We were able to install our TripleSafe sump pump for them. This is our top of the line pump that has 3 pumps in 1 liner. The first pump is the main pump to get the water out, the second is there in case of a lot of water and you need back up, the third pump is battery operated in the event your power goes out. TripleSafe also comes with an airtight lid so water won't evaporate back into your basement and it even has an alarm if it can't keep up and you need to take action to prevent a flooded basement. SmartJacks are steel support systems used to stabilize and level the girders and floor joists. The heavy duty system has been laboratory tested to support loads of more than 60,000 pounds (that's a lot of weight). Being able to support that much weight makes SmartJacks a great option to stablize sagging floors and any walls and belongings on top of that floor. This customer contacted us because she was having some remodeling work done and the contractor doing the work was concerned about the sagging floors and foundation because there were cracks in the ceiling and walls. She was also planning to move within the year so we were able to restore her properties value with these heavy duty SmartJacks. One homeowner in Okemos, MI called us about their sagging floors. So, we drove to their property to give them a free estimate, we found the root of the problem which is the foundation of the floors in the basement. The floors needed to be reinforced so that they wouldn't sag so we installed our advanced SmartJack technology. The SmartJack is a support system used to stabilize and level the floor joists in a crawl space. This system can support up to 60,000 pounds. The SmartJack system is placed on strong concrete fillings that have replaced the soil in that small location underneath the SmartJack. Now, this homeowner won't have sagging floors ever again. Our friends from Lansing, MI, Dave & Lorie were highly satisfied with prior work we completed at their home. So, when they noticed their driveway sinking away from the garage, they knew right away who they wanted to call, us! We used our unique product offering Poly Level to return Dave & Lorie’s cement to its original position. PolyLevel raises concrete through unique qualities of expanding polyurethane foam, making it: environmentally safe, affordable, waterproof to prevent future erosion, quick and mess free, and a permanent solution! Poly Level not only results in a solution that looks better and lasts longer, it is also less destructive to the applied surface. Thanks Dave & Lorie for another opportunity to beautify your home! The homeowners in Lansing, MI were noticing water coming into their finished basement through the corners of their walls. Their original sump pump was not removing the water from their home effectively and they did not want the water to damage their floors, walls or belongings. Our professional team replaced their old sump pump with our SuperSump sump pump. The SuperSump is a full-featured system that includes the best components available. It includes the SuperLiner, which is an airtight lid that looks more attractive, keeps pests out and eliminates safety hazard of an open sump pump. It has a floor drain in case an unforeseen accident puts water on your basement floor. It includes a WaterWatch Alarm, which alerts you if the water level rises above the sump pump intake. It has a cast-iron pump to prevent overheating and burnout. It has a CleanPump pump stand that elevates the sump pump to prevent clogging. It has a check valve to prevent pumped water from re-entering. Lastly, it has an improved float valve to ensure long-term performance. Pam K. of Dewitt, MI had a crack in her basement wall that was causing the foundation to slant. This creates a serious issue for the structural integrity of the home and Pam needed a solution. Good thing for her, we had one. We installed our PowerBrace foundation wall repair system. The PowerBrace system is a wall repair system that stabilizes tilting, bucking, cracked or bowing foundation walls. PowerBrace uses steel I-beams that attached to the joists above the wall to provide maximum support. And even better, the system can be tighter over time to eventually bring your basement wall back to near its original position. PolyLevel is a state of the art approach to repairing sinking concrete. This method to raise your concrete slab uses high-density polymers to lift it back to the desired position. This process is done by drilling small holes (smaller than a penny), in the slab and then specially designed equipment with inject the structural grade polymers into the voids. There are many advantages to using PolyLevel: there are less holes, it's lightweight, it has a quick cure time so it can be driven on within 15 minutes, the material is waterproof and won't wash out, and it gives you peace of mind knowing no one will be tripping in your driveway. These homeowners from Fowler, MI called us about their basement wall that began developing cracks. The homeowners braced the wall on their own but knew they needed to seek a permanent fix. They were extremely concerned and called us to seek professional help. We came to their home and installed wall anchors. Wall anchors are perfect for returning the wall back to its original position and reinforcing the entire foundation. We stabilize the home with a steel rod that runs from the wall anchor to an anchor placed in the exterior of the home. Once we place the plates we have permanently stabilized the basement. The homeowner in Lake Odessa, MI gave us a call when he realized his basement needed some waterproofing due to the winter snow! Our professional team knew exactly what to do! The team installed our IceGuard system on the pipes that are outside of the home for the water from your sump pump to travel through. The sump pump discharge line can freeze in the winter months when the ground freezes. The IceGuard system automatically allows the water to escape from the sump pump discharge line if the water freezes or gets clogged for any reason. This system makes sure that the water is not going back into your house! Thanks to IceGuard the homeowner doesn't have to worry about water getting into his home during the winter months! The homeowner was shocked when he went downstairs to find 14-16 inches of water in his basement! The sump pump he has was not doing what he needed to be done so he called Ayers Basement Systems to tackle the job! Our professional team installed a TripleSafe sump pump into the homeowner's basement. The TripleSafe sump pump is actually three sump pumps in one. The first pump will do most of the pumping very effectively. The second pump is more powerful and has a separate discharge line that will be there for you in case the first pump fails. The third pump is equipped with batteries so it will still work effectively in case the power goes out. The TripleSafe sump pump will keep the homeowner's basement dry with triple protection and is the most reliable sump pump you could have! Our staff received a call from a local property manager in Portage, MI. One of the sidewalk squares in front of a building he manages had sunk over half an inch. He had become concerned about the safety hazard and liability this had posed. Upon receiving our new friend’s call for help, we examined his sidewalk liability concerns and recommended our unique product offering PolyLevel to return the sidewalk back to its original position. PolyLevel raises concrete through unique qualities of expanding polyurethane foam, making it: environmentally safe, affordable, waterproof to prevent future erosion, quick and mess free, and a permanent solution. PolyLevel not only results in a solution that looks better and lasts longer, it is also less destructive to the applied surface. PolyLevel was able to level the sidewalk in front of this local office building and it can save your sidewalk too! Give us a call today for a free estimate. This Kalamazoo, MI Garage wall has seen better days. The concrete garage wall had an enormous horizontal crack spanning the length of the whole wall. Not only is this a scary sight for any homeowner, but the fear of knowing this wall can erupt any moment would send shivers down any spine. Not to worry, we have a solution for this problem. Our PowerBrace system was installed to anchor this wall to provide stability and support. These steel I-beam are placed along different sections of the wall, stretching floor to ceiling in length, and are secured into place with steel brackets. The anchors have the ability overtime to straighten this wall back out to its normal position. Pathways to the front door see a lot of foot traffic and it can be dangerous if the cement is unlevel. This sidewalk could be a tripping hazard, it's not very appealing and it can pool water especially in those cold winter months with all the snow. We used PolyLevel to inject structural grade polymers beneath the cement which will lift it back up to its desired height. PolyLevel cures quickly and can be driven on about 15 minutes after the material cures. The material is also waterproof so there's no worries that it will wash out. An uneven porch or driveway is never good: it causes a tripping hazard, doesn't look the best and can reduce the resale value of your home. We have come up with a new solution that uses modern technology to fix your uneven slabs. You start by drilling small holes in the concrete, smaller than a penny, and then structural grade polymers are injected into the void. The material injected is very lightweight and the best part is that it cures in 15 minutes. That means it can be drove on, walked on etc. almost right away after the work is completed. The material is also waterproof so there is no need to worry about it being washed out beneath the slab in the future. A Granger homeowner called us about her wet crawlspace so we gave her a free estimate. After giving her a free estimate we decided to install our advanced CleanSpace technology. CleanSpace is a 20 mil thick plastic liner that fits to the crawl space to completely seal the home from the earth. Polyester cord reinforcement allows for a lot of durability, to make it last longer than the home will. This liner also contains an antimicrobial additive to prevent mold. CleanSpace is the perfect mold fighting product. Now, this homeowner will never have to worry about a wet crawlspace again. Our friend in Granger, IN began experiencing water seepage through the poured walls in her crawlspace. She grew increasingly concerned when she noticed several of the wood floor supports under her home were beginning to rot. She needed professional help, and we came to her rescue! After diagnosing her crawlspace needs, we installed our patented CleanSpace crawl space encapsulation system in the crawlspace. The CleanSpace encapsulation product is a 20mm thick plastic lining that entirely seals off the crawl space from the harsh elements below. To supplement the CleanSpace system we installed the SaniDry Sedona, a high-performance dehumidifier and filtration system. In Nina’s crawlspace, the Sedona will help prevent mold and reduce musty odors, giving her dry healthy air and total comfort. With this encapsulation system in place, Nina’s crawl space will now be a safe and dry space.